These stunning plants will light up your garden with breath-taking late displays! Perfect for beds and borders, they'll produce an abundance of large, pretty flowers. Each will rise up from the attractive foliage and open up to show elegant, satin-like petals. 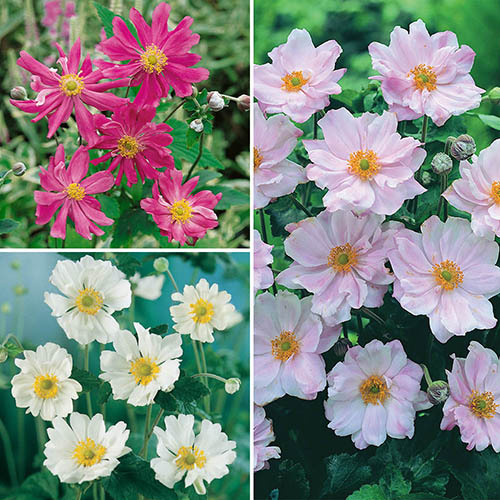 Varieties included 1 each of : Whirlwind, Prinz Heinrich AGM & Queen Charlotte AGM. These stunning plants will light up your garden with breathtaking late displays! Perfect for beds and borders, they will produce an abundance of large, pretty flowers just when others in your garden are starting to fade. Each will rise up from the attractive foliage and open up to show elegant, satin-like petals and a bright yellow contrasting centre. They will look brilliant in mixed or herbaceous borders, in any partly shaded area. Leave them in the ground over winter, under a good layer of mulch, and you will be rewarded with bigger, better displays for many years. Whirlwind - Graceful, pure-white flowers on long stems. Queen Charlotte AGM - Large light pink flowers. Supplied as a pack of 3 potted plants in 9cm pots, ready to plant straight into garden.